The natural life span for a chicken is 8 to 15 years. Laying hens can produce between 200 and 300 eggs each year; they're typically most productive in the early years. Hens begin laying eggs when they are between 5 and 6 months old. Many hens slow production or stop laying completely as they advance in age. As hens age, they are more likely to experience health problems. 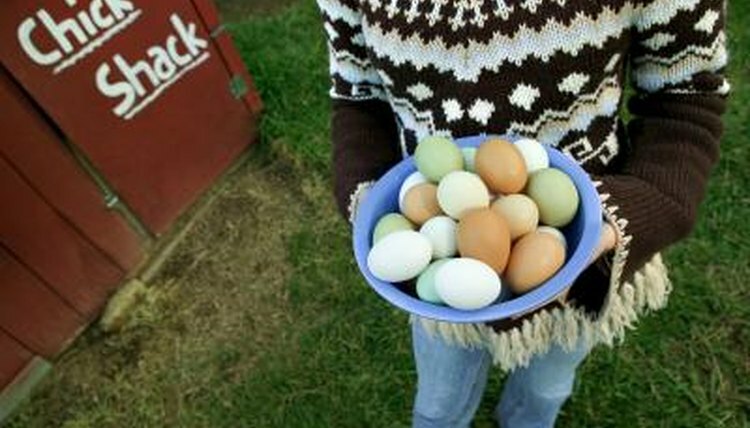 It is not unusual for a hen who is age 5 or older to stop producing eggs completely. Failing to produce eggs can be a sign of aging or underlying health problems which are preventing the production of eggs. The cease or decrease of egg production is often one of the first signs you will see indicating that a hen is sick. Other symptoms of illness include dull eyes, poor feather quality, skin irritation, changes in roosting behavior and poor quality or deformed eggs. Chickens become "egg bound" when they are producing eggs normally but failing to get the eggs they have produced to exit their bodies. Egg binding may be the result of stress, dehydration, an egg that is too large or a diet that lacks enough calcium. Make sure your chickens always have plenty of water, and provide a diet that has been checked and approved by your veterinarian. If you believe your hen is egg bound, you will need to take her to the veterinarian. Egg peritonitis is a condition that occurs when a hen lays eggs into her own body cavities rather than laying them outward like she is supposed to. Internally laid eggs build up inside the abdomen and ultimately cause a hen a significant amount of pain. The hen will appear to be a poor or nonlaying animal. She will appear to have a large abdomen and may suffer from breathing problems. Hens with peritonitis are not good layers; they often have to be either sterilized if not euthanized. Older laying hens are prone to tumors. Tumors can develop as the result of Marek's disease or lymphoid leukosis, conditions caused by viruses that transmits from chicken to chicken. Affected birds may not show outward symptoms; they may be poor layers or show varying signs of discomfort. Tumors make hens unsafe for consumption. They're often not discovered until the birds are processed for human or animal consumption. Regular vaccination, veterinary care and daily observation of your chickens can help prevent the development of tumors and aid in your ability to treat your animals so they do not suffer.